« Pssst. Don’t Tell Anyone. An “I Have a Lot of Notes Today” Note from Fatty: This is just a note to say that I have quite a few pre-story notes today. But I also have a story. And also, every one of my notes is worth reading. So do. A “Sign Up for Something You Should Sign Up For Anyway and Maybe You’ll Win a Free Bike” Note from Fatty: I’m a big fan of The Feed, a service that makes it easy to get the energy food you want for cycling at a good price, at the right frequency, with excellent guidance. 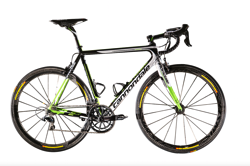 And right now, they’re having a contest where if you give them your email address, they’ll enter you in a contest to win a Cannondale SuperSix EVO Hi-MOD road bike. This is a serious road bike, with a value of around $7500. It takes roughly thirty seconds to enter, so you should. Click here. A “Hey, Read This” Note from Fatty: I believe I am Janeen McCrae’s (aka The Noodleator) biggest fan. I have in fact recently begged her to start writing for Fat Cyclist. She declined, politely. So for now we’ll all have to be happy with whenever she writes something in her own blog. Which she has. 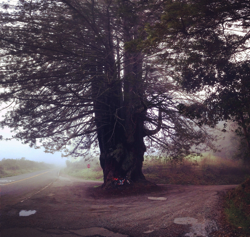 “Tour de Tree: Groundhog Day Edition” is a wonderful ride report about an incredibly bad idea for a race. Click here to read. A “Yes the Contest is Still Going” Note from Fatty: I’m not going to browbeat you today about the WBR Fundraiser I’ve got in progress, except to assure you that, yes, it is in progress. And also that you should enter it. And even more also that upon entering this contest, you will be doing a lot of good for people who need it. Read here for details. Let me start this story with a rare piece of honesty: it centers around a boast I will make. More honesty: I shouldn’t care about the event around which this boast is made. Still more honesty: I do care. Deeply. More often than not, The Hammer and I ride together. It’s been that way for the five-plus years we’ve been together, and I love it. It’s rare that anyone joins us for our rides, because when The Hammer and I ride, to most people it feels like we are training. Even when we’re just — truly and honestly — just riding along, recreationally. As it so happens, The Hammer and I like to kind of flog ourselves to within an inch of our respective lives when we ride our bikes recreationally. So, as I said, not many people ride with us more than once. But my niece Lindsey and her fiance, Ben, have been riding with us. Mostly, this is because The Hammer and I are wonderful people to converse, ride, and otherwise be with. It’s also possible that Lindsey and Ben are planning to race the Leadville 100 this year, and are looking to their elders for experience and wisdom and stuff. Though I kind of doubt it. 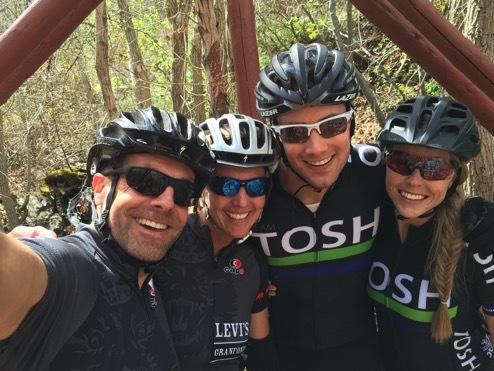 Regardless, out of the three most recent Saturdays, Lindsey and Ben have been riding with us twice: the first time on a long road ride, and last Saturday, on a big ol’ long tour of most the trails of Corner Canyon. Seriously, folks, is there anyone in the whole world who takes selfies as well as I do? We were there to ride together. Just ride together. To put in a bunch of miles at a good solid pace. And that is, no kidding, what we did. 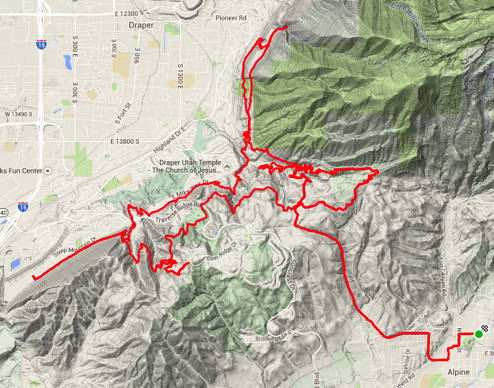 Except on the downhill sections, where I needed to show that I was the boss. Why? For several very excellent reasons, none of which I choose to reveal at this time. But I guarantee that it was not because Ben is half my age and looks to have about twice my fitness and I thus felt like I needed to prove something to him. No, that was not the reason at all. These are very good objectives. Very good indeed. But as the day went on, I noticed that — more and more often — our ride broke up into two groups: The Hammer and Lindsey riding together and talking in the back group…and me riding out in front of Ben, with him scant inches behind me. Which I interpreted in a certain way. A much different way than I interpret this same distance when on a road bike. See, when someone is right on my tail on a road bike, I interpret this as good riding technique: drafting and conserving energy, so that I can pull over sometime in the next thirty seconds and trade places. On a mountain bike, however, when someone is right behind me, I interpret it as a challenge. “You want to come around?” I asked. The gentlest form of a call-out. “No, this is a good pace,” Ben replied. Which would be fine, except I was going out of my way to ensure that it was not a good pace. More to the point, I was gradually ramping up my effort, trying to crack him. Hey, I’ve finished Leadville in 8:18 before. He’s on record as wanting to finish it this year in 10:30. I should be able to crack him easily. Except Ben wasn’t cracking. He was staying on my wheel, our respective better halves no longer anywhere in sight (they were happily chatting about weddings, not to mention racing LoToJa together this year). I was, with Ben’s help, proving the old maxim that there is no such thing as two men riding together. You get two guys on bikes, and it’s a race. Anyone who says otherwise is just trying to disavow the incontrovertible fact that he just lost a race. Which brings us to my plan: to prove to Ben that I am the alpha male, once and for all, in the Maple Hollow spur: a one-mile grind of a singletrack climb. The four of us regrouped at the turnoff that marks the beginning of the Maple Hollow climb, where I assured the group that I was done pushing it for the day, and that we should just get to the top. A lie, and everyone knew it. If by no other reason, by the way I didn’t make a faux-courtesy show of asking if anyone else wanted to lead out. I led out from the sound of the gun, heard in my head…and, judging from the way he immediately grabbed my wheel, heard in Ben’s head too. This climb, I didn’t make a show of just riding along. No. I stood up, using singlespeed climbing tactics, even though I was not riding a singlespeed. Big gear, low cadence, edge of agony. Use your whole body to power up the climb. Ben stayed right with me, as I expected him to. I listened for a very particular sound. But it wasn’t there. I listened for that sound. Still not there. So I went harder. Listening, listening. I swear, that is the correct phonetic pronunciation for the sound I was listening for: the ever-so-slight sound a brand-new Shimano XTR drivetrain makes when you shift up the cassette one single gear. It is, in short, a flinch. And thus did I vanquish Ben and prove…well, nothing. But one last piece of honesty here: I would — and probably will — do it again. Which may be why it’s so rare that anyone wants to ride with me. I’ve always thought of myself as “not particularly competitive.” I realized the other day, though, that that goes out the window as soon as a friend starts catching me on a climb. At which point I drop the hammer and do my best to shake them off. Like you, every single time. Except I’m not in anywhere near as good of condition as a world-famous beloved cycling blogger. When you’re leading a climb, absolutely demolishing yourself trying to crack a wheelsucker, THAT is the best sound in the universe! It’s when you KNOW you did it…and now all you have to do is dig a little bit deeper for a little bit longer, driving the knife deep into the heart for the kill. It’s not Red Bull that gives you wings, it’s the “Tzclnk” sound. But no, it’s not a race. Nope. I tend to ride most of my rides pretty hard because hey going fast is fun. It is truly a beautiful sound unless it comes from your own bike. You win some you lose some as I have been getting older I’m losing a few more than I would like. “You get two guys on bikes, and it’s a race. But back to my joyful alacrity of reading Fatty’s work… it pleases me. It inspires me. It makes me loathe the bike-riding me. But mostly, it just makes me joyful. And alacritous. And I’m putting that in a script. “Joyful Alacrity.” Maybe a band name, or the name of a mysterious femme fatale from Indonesia. Even though it is slightly, barely, kinda, hardly noticeably redundant. Yeah, we have group road rides most Saturday’s here and even when we say it’s just a friendly ride, at some point someone, often me, ends up going 23 mph into a headwind on their pull and all of the sudden everyone seems to be using their pulls to try and drop everyone else. con·ver·sa·tion?känv?r?s?SH(? )n /noun, the informal exchange of ideas by spoken words. pace, p?s/, noun, consistent and continuous speed in walking, running, or moving. nothing worse than hearing that sound coming from hundreds of riders in front of you on St. Kevins and your sitting on a SS trying to turn the cranks – otherwise it is a glorious sound. I always chuckle when I hear the old adage “it’s not whether you win or lose, it’s how you play the game”. This is spoken by the losers of course. One of my fondest memories on the road bike was leading my big brother on a climb (sadly, it was about 6 years or so ago) up Hwy 1 heading towards Jalama Beach (it was a Friday…a work-furlough turned into an awesome ride day). I was holding the absolute best pace I could, just praying for that sound as he was on my wheel. There was no talking. When I finally heard THAT sound, the angels sang and there was much rejoicing in my heart. I buried the knife deep after that, knowing this was a rare moment. And I’ve paid DEARLY for that moment ever since. It was the LAST time I’ve been stronger, so I hold on to it cuz it’s all I’ve got (he is doing solo centuries every Saturday, except for the days he does a double). He is sick I tell you, and thankfully I did not catch that bug. Ahhh…the older I get, the better I was. I hate that my life is so busy now I rarely read FC like I used to… so I appreciate the twitter alerts when you have new content. I’m very nostalgic today and melancholy. The upshift (downshift? I have never figured out which way is which) sounds distinctly like a “klunk” sometimes followed by a “ting!”. This is a great sound to hear from in front of you if you have been politely, and tortuously, hanging back and letting someone lead the pace on the climb. It can be fear inducing if heard from behind, and you are trying to maintain your alpha climber status in the group. The other great sound is silence. Like when you no longer hear the knobbies and drivetrains behind you because you just gapped the the group mercilessly. I have heard this non-sound exactly once in a race, and I oh so want to hear it again. Riding with DaveT is similar. He rides until I’m buried, and then just stays about 20′ in front of me the rest of the way. And then he offers to help walk my bike (true story… I did a lot of walking @ Henry Coe). But, much like you, he is a great person and I love riding, drinking, eating, partying, and generally hanging out with him. You need more friends like me locally… I’d keep riding with you even if you buried me on every ride. You’d get a confidence boost, and I’d get less fat. “You get two guys on bikes, and it’s a race.” I doubt there has been or ever will be a more accurate axiom. A couple of weeks ago a bunch of local riders meet for a “no drop early season ride, pace of 18-19″ the first drops occurred less than 3 miles from the start. Drops kept occurring throughout the ride, soon we were pace lining 23+ into the wind. When the ride turned so we had a tailwind every single stop ahead became an all out sprint. That was a fantastically fun group ride! I guess that’s why I ride alone. Fatty, you’ll NEVER hear that sound with me behind you, because i’ll have been in my granny gear from the very first hint of an incline. Corollary to your premise: the WORST feeling in the world is when you are dying up a climb, with legs shaking, and have no further gear to use. And people wonder why I like to ride by myself. It has been a long cold winter in Ottawa Canada. You won’t hear that sound from me as I will be in the granny gear from the start….why is my XXL Fat Cyclist jersey too small all of a sudden?…. I’ll ride with you anytime (road) Fatty! Nothin’ like pushing each other that little bit. I never race because I am slow, but I also enjoy stopping to take photos. It’s so beautiful here and most of our century rides have the most amazing scenery. If I go all out fast, I miss so much and it’s just too beautiful to do that. I’m okay being slow for the most part. Also, nice to see Paul Guyot back in the comments again! :) And AlaskaJill! Thats the great sound you were waiting. So, I was thinking about this post on my drive to work this morning and, it occurred to me that, if I win a fancy new bike and an opportunity to ride with a World-famous and beloved blogger, I will have to go deep into the pain cave. For, I will not willingly give you the satisfaction of that sound. Either that or, I will record that sound and play it back on my phone while we’re riding and, when you try to thrust the knife deeper, it will frustrate you to know that I shifted down a gear and, as you go harder, I’m easily keeping pace. All in good fun, yo, just to mess with you! Another tell-tale sound time is when there are upcoming sprint-points in a group ride. When you’re in front of people (who are intentionally drafting in preparation to blast around you for the sprint) you need to be listening for the ‘other’ sound (up-shifts), and be READY to up-shift and jump with them, otherwise you’ll be left in the wind. Blind people would probably do very well in cycling due to their intensified hearing sense…other than the part about staying on the road or trail. But other than that ONE tiny little issue, they’d be AWESOME! Went on the first fast group ride since I stopped racing yesterday, and was rudely reminded that every “ride” involving males is a race. Hardest I’ve gone since I dunno when; I was toast, but I didn’t get dropped. SUCCESS! 48 vs. 26. That’s an impressive “Tzclnk,” The math is not on your side. I’ll ride with you too, anytime! That would be amazing. Does the sound of wheezing behind cause you to go faster or does your compassionate side come out & you slow down to ensure you will continue to have a riding companion? I’m like AKChick, I tend to stop & take photos along my rides. It does hamper the “endurance” part of training but gosh, there is some stunning vistas in this world! With my lousy lungs I’m not as competitive as I dream of being. Though downhill I rock at!